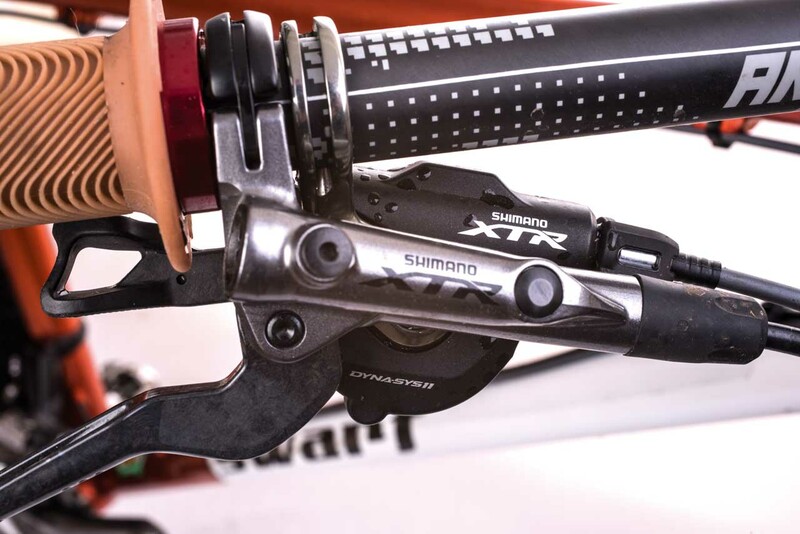 Shimano’s latest XTR Race brakes are, as you’d expect, gorgeous. They’re elegantly sculpted, and of course they retain the basic overall shape of Shimano brakes from the past – if it ain’t broke, don’t fix it. But there has been considerable effort to save weight. 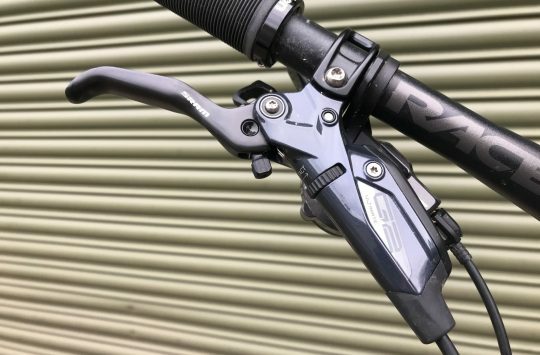 At the handlebar, the magnesium master cylinder runs inboard from the short, highly shaped and dimpled carbon fibre lever. Unlike its sister XTR Trail brake, there is no reach adjustment possible without a hex key, again to save weight. 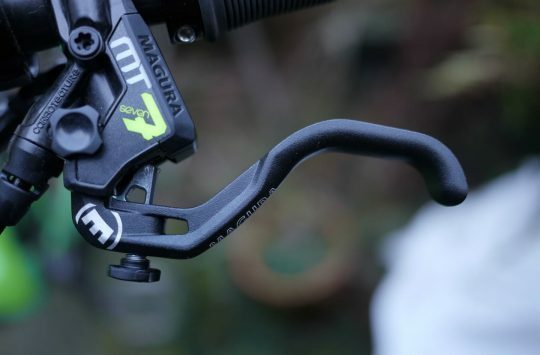 This brake also lacks the Servo-wave technology of its Trail counterpart, for the sake of a few grams. Even the handlebar clamp is noticeably slimmer than the old one. The caliper itself has come in for some weight saving too, as well as some modifications which are meant to enhance performance. A magnesium body couples with G02A pads (which basically means they’re resin pads, with an aluminium backing plate) to – yes, you’ve guessed it – save weight. There’s a phenolic piston with a special heat resistant coating. There are, of course, titanium mounting bolts. All this means that a pair of Race levers comes in at an impressive 122g, according to Shimano, compared to XTR trail levers, which are 188g. The Race calipers are 182g front and rear. Including hoses (but without rotors), the all-in weight is around 400g, comparing to around 530g for the Trail brakes. Not bad – although some competitors are lighter yet. The FREEZA rotors are a cunning finned sandwich of aluminium and steel. The steel sits on the outside, and provides the braking surface. The aluminium is the filling – but it spills out around the inside in a radiator fin, which is cunningly shaped to increase heat loss. 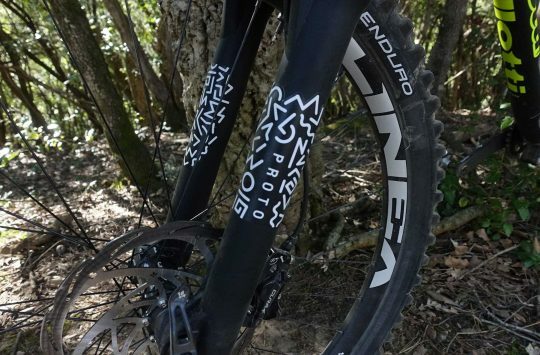 In fact, Shimano claims a reduction in rotor heat of 50°C, which should have a concomitant beneficial effect on pad and rotor life during long descents – essentially, you get less brake fade. The rotors are only available in Shimano’s Centre-Lock rotor fixing though, so owners of standard six-bolt wheels will have to make do with a non-finned version. Installation was as simple as you’d expect from Shimano. You can install the levers without removing your grips first, and everything comes preassembled. If you need to shorten cables (or switch them from right-rear to left, as we did), bleeding them is a piece of cake – as long as you’ve got the requisite bits and pieces (or a little ingenuity). Once that’s done, then, it’s time to hit the trails. It’s immediately obvious as soon as you’ve ridden a mile or two that these brakes are not as powerful as other brakes in the Shimano lineup. The removal of the Servo-wave certainly serves (arf) to lighten things up, at the expense of raw power. Another side effect of this, though, is to makes the brakes feel a little more progressive than other Shimano offerings. If you’ve previously avoided Shimano because they’re a little on/off, then perhaps these may be the answer. There’s an argument to be made in favour of less powerful, more progressive brakes for cross-country bikes, of course. Living as we do in the United Kingdom, it’s a little hard to find alpine regions where the finned rotors claimed reduction in rotor heat is immediately noticeable. But I can report that I’ve indulged in a few of the longer descents hereabouts and elsewhere with no issues whatsoever. At the start and at the end of the descents, it’s perfectly possible to lock either wheel up with enough pressure at the lever, despite an initial lack of bite. But the brakes do feel a little, well, spongy, for want of a better word. 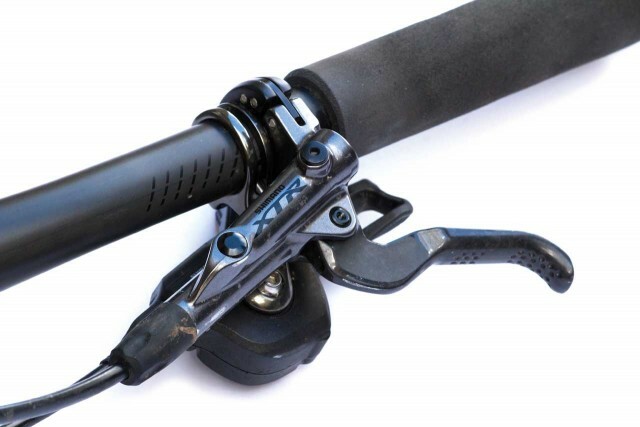 Changing the pads did nothing to alleviate this – Shimano pads are typically some of the best around in my experience, and these were no different. I’ve bled the brakes, which may have improved the feel slightly, but to such a small degree that it’s hard to tell objectively. I suspect the culprit could be those slender lever handlebar clamps. If you squeeze the brakes (you don’t even need to squeeze them that hard) you can see the levers flex outward about the clamp point. It’s not much, but it is noticeable, and I wonder if it’s this that decreases feel somewhat. These are, as you’d expect, fabulously made, and the lightest brakes in the Shimano lineup, even if they’re not as light as the lightest from other manufacturers. They are easy to set up and bleed, and work consistently. But to achieve their low weight, compromises have been made which affect how the brakes feel at the lever. Instead of the impressive power of previous Shimano offerings, these XTR Race brakes provide smooth progressive stopping, but with a somewhat flexy feel.